Chalet Kiwi is situated in the heart of Grindelwald village, a 5 minute walk from the main railway station (where you can find trains to Männlichen, Kleine Scheidegg , the Jungfraujoch, ...). Walking distance to bus stops, the Sports Center with indoor swimming pool and ice rink, restaurants. Covered Parking. This is a 4-star, 2-bedroom apartment for up to 4 people - ideal for a family with children, or couples. The apartment - 101m2 or 1120 sq ft - is on two floors. The 1st floor has a living/dining room with a wood burning stove, an integrated kitchen, and a WC. The 2nd floor has two bedrooms, and a bathroom (shower/WC). The balcony has a view of the North Wall of the Eiger. The Kiwi Chalet in Grindelwald was fantastic! The Chalet was beautiful with very comfortable furnishings, a fabulous view of the Eiger and only 5 minutes walk from the train station, perfect as we did not have a car. Piotr was always prompt with his replies and even emailed us during our stay to make sure we had everything that we needed. We received an activity card upon check-in which gave us free bus service in Grindelwald and discounted entry to the pool and other activities at the Sports Center. We highly recommend this lovely Chalet and hope to return soon. Thank you Piotr! It was great pleasure to be of service for Donna and her family. We had very good communications concerning logistics of their stay. I am so happy for them to have had a good stay. Piotr was very helpful to us, as we had a question about the washer and he was very responsive. His place was immaculate and very spacious for our family of four. The back porch looked right at yhe mountain, which was stunning. The walk to town was short. I highly recommend. Thanks so much, Kent. We try our best. 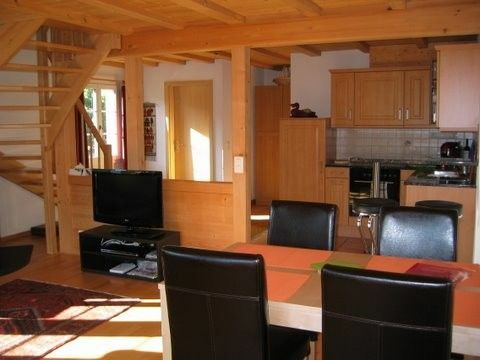 This is a lovely chalet set in a very convenient location in Grindelwald. Very easy access to train station, bus station, supermarket and tourist information centre. Stunning view of the Eiger out the living room and twin bedroom window. The chalet was spotless. There were also dishwasher tablets and the correct bin bags left for us which was very helpful as Grindelwald has a strict policy on waste disposal. It was very warm when we visited. We would return to this property. We try our best to satisfy our guests. Thank you for your appreciation! Wir versuchen unser Bestes, um unsere Gäste zufrieden zu stellen. Vielen Dank für Ihre Wertschätzung! This was a really nice chalet with all the facilities that one would want. It was clean, spacious, well provided for, and it was within easy walking distance of the village centre. The railway station was less than 10 minutes walk away and there was a COOP supermarket within easy walking distance. There is also secure parking associated with the property.Everything was well organised beforehand and Piotr dealt with all enquiries promptly and efficiently. We spent a really nice week there, and were we to return to Grindlewald we would have no hesitation in renting this property again. Last but not least, the property has a superb view of the mountains. We appreciate the review. we try our best to make our guests happy! My family and I really enjoyed staying in this apartment. It is in a great location minutes from the centre of town but in a very peaceful and quiet neighbourhood. The apartment is very spacious and well laid out with an excellent kitchen and a comfortable living room area.The two upstairs bedrooms are a good size with comfortable beds.The property is obviously well maintained and was spotlessly clean when we arrived.I have no hesitation in recommending this apartment to other travellers and would certainly stay there again myself. Thank you for your review. We strive to provide the best service! Kiwi lodging is just as advertised and is very clean. View of the Eiger from your personal balcony. Perfect location for up to four people. Within convenient walking distance to the heart of Grindelwald and the entire Berner Oberland Bahn transportation locations. We will visit again during hiking season. The owner, Piotr, has been a pleasure to work with and he is expeditious with his communication.